make free calls over the internet to any of your online friends. 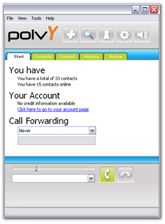 With poivY you can make free calls over the internet to any of your online friends, as well as various popular destinations. Download poivY now for free and start calling immediately. To enjoy phone calls from your PC!! !